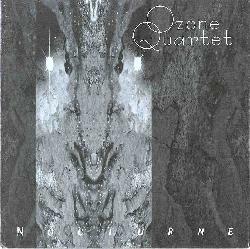 Ozone Quartet is yet another of North Carolina's fiery instrumental ensembles. My introduction to this band was at the Progscape festival in 1995 when they opened the show in their previous incarnation as Cloud Nine. Then and on the Ozone debut CD I described the music as instrumental fusion that crosses Mahavishnu Orchestra and The Dregs with the heaviness of mid-period King Crimson. And when I reviewed their CD "Fresh Blood" I noted that the addition of a new guitarist gave the band a much heavier sound. Well looking at their web page it turns out that original guitarist Graham Fry was still present on that album, but on "Nocturne" they really recruited a new axeman, one Kenny Thompson who joins Hollis Brown on electric violin, Wayne Leechford on Chapman stick, and Francis Dyer on drums and percussion. Throughout Nocturne's 12 tracks Hollis' violin trips the light cosmiche while Leechford keeps a steady flowing stick beat. Thompson's guitar at times has an aggressive "Red"-era King Crimson edge but when soloing usually has a cleaner more fusion-like sound. When the quartet cranks and the four musicians are blazing along the intensity level is well outside the ozone layer. I deliberately put this after the Smokin' Granny review as both bands are among the cream of North Carolina's exciting instrumental outfits. You can visit Ozone Quartet at their web site.